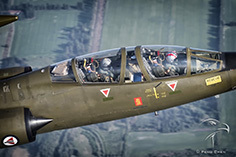 The story of the Starfighter starts in the early 1950s, when American pilots were interviewed by Lockheed representatives on their requirements for controlling the skies over Korea. They were looking for speed and accuracy. And that’s what Lockheed set out to provide them with. The design they came up with was the F-104, a development-process they started without a clear USAF requirement or contract to begin with. The first two prototype XF-104s were smaller than the subsequent models as they were fitted with the J-65 engine. The XF-104s proved the concept but lacked the envisioned Mach 2 performance. This improved when the General Electric J-79 became available for the pre-production YF-104A and subsequent production aircraft. 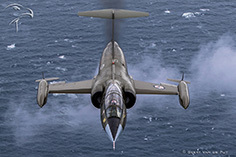 Lockheed kept working on extending the capabilities of the F-104. 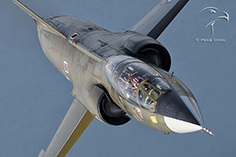 The F-104A/B were purely a interceptors, which set many speed and climb-records when they were introduced into USAF service, but the F-104C/D already had multirole capabilities. 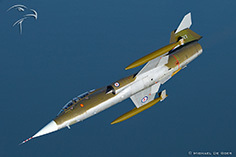 It could be used for close air support as well, however, the small wings made it less maneuverable, its single engine made it more vulnerable and it’s small fuselage and wings gave it less hard-points for a mix of air-to-air and air-to-ground weapons than the F-4 Phantom. 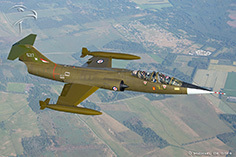 Therefore, the F-104 didn’t have a long career with the USAF. Some F-104As were converted to drones (QF-104A) in the early 1960s and F-104C/Ds were passed-on the Puerto Rico ANG by the end of the 1960s. Export to other NATO partners was how the F-104 finally became a huge success for Lockheed. 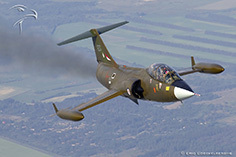 The F-104C was developed into the F-104G, which became the mainstay of NATO. 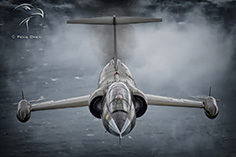 Germany took delivery of 916 Starfighters, the Netherlands 138, Belgium 112, Denmark 51, Norway had 44, Spain had 18, Greece and Turkey eventually operated numerous 104s as well, as many Military Assistance Program (MAP) Starfighters phased-out by other European countries ended-up with them. 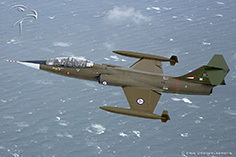 The Canadian Air Force stationed 4 squadrons of CF-104 Starfighters in Europe as well. Other operators included Taiwan, Japan, Pakistan and Jordan. The Starfighter has many supporters, who like its appearance and its raw power. Almost everybody who flew it or worked on it, loves it. It had character and demanded the full attention of pilots and technicians alike. 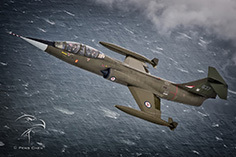 Its specific tasks in Western Europe, often at low level and in bad weather, as well as its demanding performance, resulted in a high attrition rate early-on in its career, but no-one who flew it or worked on it will ever use any of the negative nicknames the press gave it. Long after the last Starfighter was phased-out in Norway, an enthusiastic and skillful group of volunteers took one dual-seater out of a museum and got to work to get her airborne again. 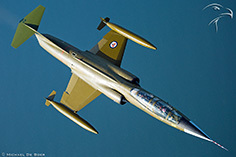 This Starfighter was CF-104D 104637. This particular airframe was built by Canadair and delivered to the Canadian Air Force in May ’62. 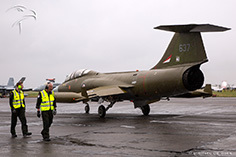 It was transferred to the Royal Norwegian Air Force in June ’73 and finally phased-out in 1983. It then resided in the Bodø Air Museum. 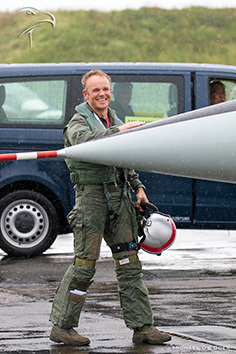 In January 2003, the Norwegian Foreningen Starfighterens Venner (Friends of the Norwegian Starfighter Association), headed by Helge Andreassen, acquired it and after 13 years of hard and relentless work, overcoming many technical and administrative challenges, 637 took back to the air again on Sept. 28th, 2016, with Norwegian test-pilot Eskil Amdal at the helm. They had not just bring the aircraft back into flying condition, but they had to modify her to make here easier to maintain and operate. 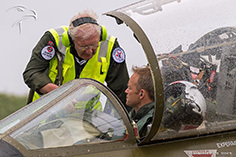 This included for example fitting Martin Baker ejection seats, F-16 batteries and an F-16 oxygen-system. 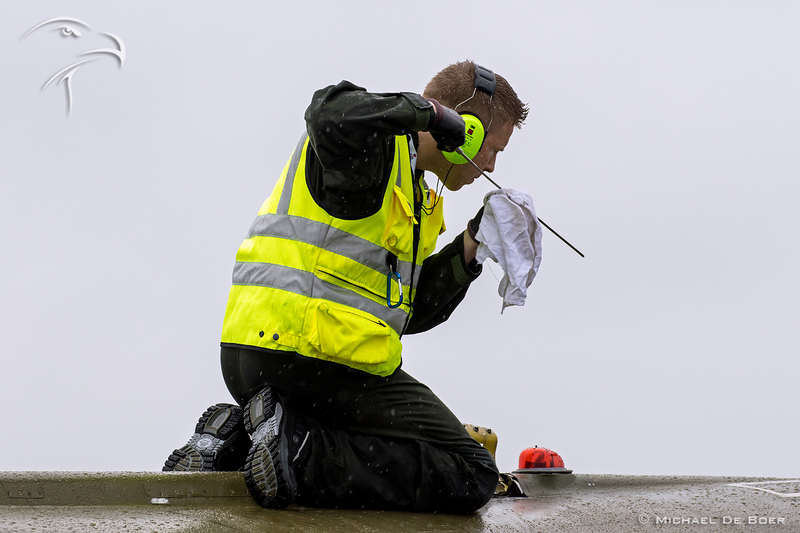 Meanwhile, it was placed on the civil register as LN-STF with the assistance of the Norwegian CAA. This year, finally, they started to participate in airshows. The first airshow they attended and performed at was at Sola, in Norway, on June 10th. 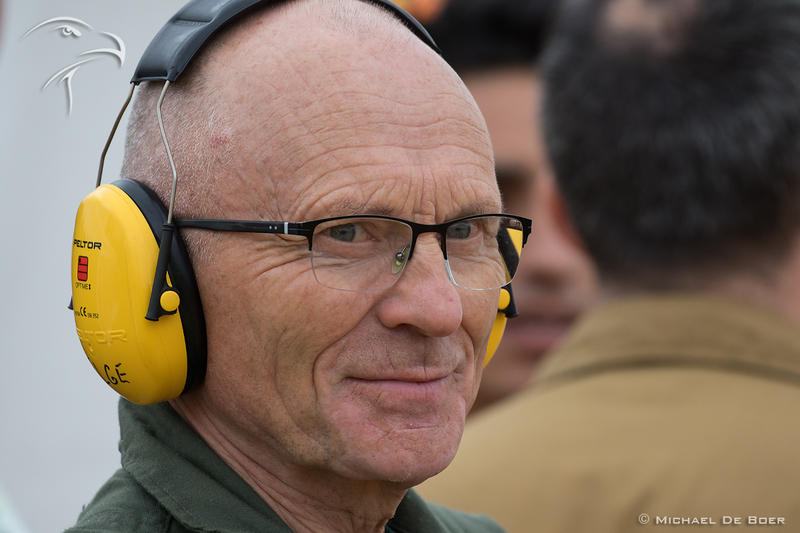 Meanwhile, when setting up the Aviation PhotoCrew’s project at the Aalborg, we contacted the team in Norway, when it became more and more clear that they might participate. Talks about a join-up were started, permission was granted, arrangements were made, but the last word was given to Eskil, he had to be comfortable and willing to do it on the day. It was a very tense Saturday-afternoon for us at Sindal Airport when we were trying to get hold of the Starfighter aircrew, who were busy at Sola. We spoke with Helge, who would be in the backseat and he was very positive, so everything looked promising. Eventually, we had to get airborne for a join-up with the German Transall, we had briefed beforehand, so there we were, waiting over the Kattegat, when the Starfighter contacted us and told us they would do a low-pass over Aalborg and then turned to join-up with us. Heart-rates went up a notch in anticipation! 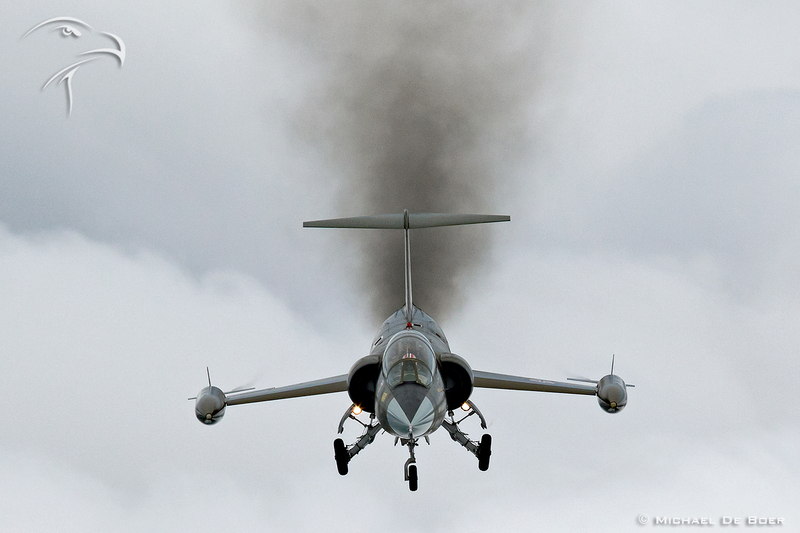 It was a wonderful sight spotting the smoke-trail over the Danish coast, with a Starfighter in front of it at quite a closure rate! On his first pass, Eskil peeled-off to the left behind us, to get an idea of our speed and his closure rate, as obviously, the Starfighter with its small wings cannot slow-down to anywhere near our Skyvan’s maximum speed. Still, Eskil and Philip, our Skyvan pilot, maneuvered in such a way that a minimal amount of time was lost between passes, to give us the maximal photo-opportunities in the time available. In the end, we got some 10 passes out of the join-up, which is amazing. The Starfighter passed underneath us, did gentle breaks to the right and the left, passed us on the left and did an impressive pass in landing configuration. There were good photo-opportunities for all photographers on board the Skyvan! The background was beautiful as well, the wonderful Danish coastline. Some of us even felt a bit emotional when we heard the famous and well-known howl of the Starfighter through our head-sets when it passed underneath us. 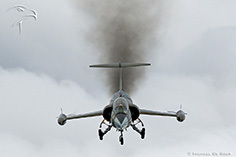 On Sunday, during the Aalborg airshow, the weather was appalling. 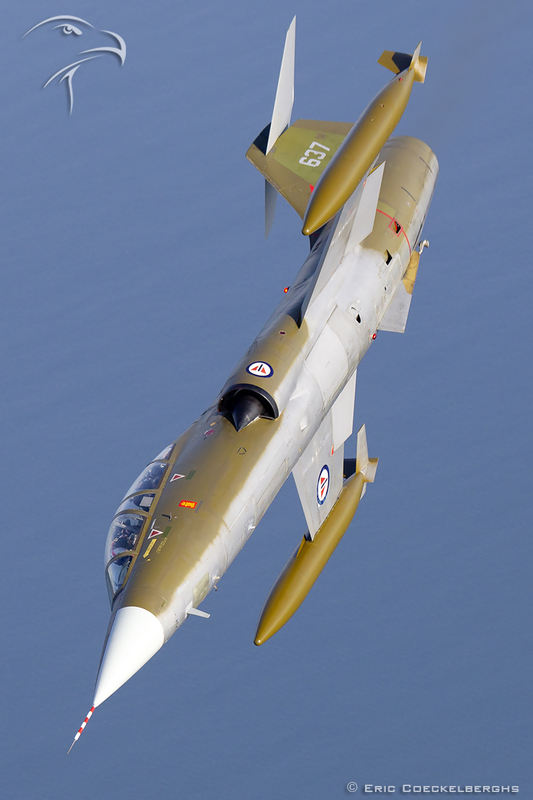 Of course we went to see everybody who had joined-up with us on Friday and Saturday, including the Starfighter team. Such enthusiastic, dedicated, skilled people! We watched them start-up 637 in the pouring rain and they were loving every minute of it. The crew-chiefs, Bjørn Ivar Lia and Sindre Nedrevåg, did the most thorough pre-flight and launching procedure we’d ever witnessed and Eskil flew a faultless low show under thick rainclouds but everybody loved it despite the rain. After their display, we met up with the team in the aircrew-tent and had a very nice chat with them, sponsoring them for their join-up on Saturday and for a possible join-up on Monday. There were plans to fly to Leeuwarden in the Netherlands for the 75th anniversary of 322 squadron, but final permission was not yet granted and no solid arrangements had been made for their arrival either, so we assisted in providing their ground-crew with some contacts. 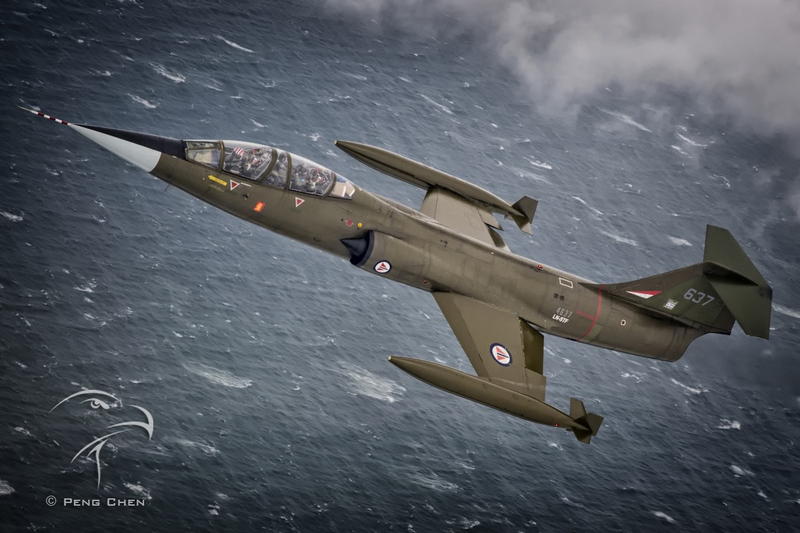 On Monday, the weather was improving ever so slowly, but we did get airborne to shoot the other participants returning to their home-bases anyway. 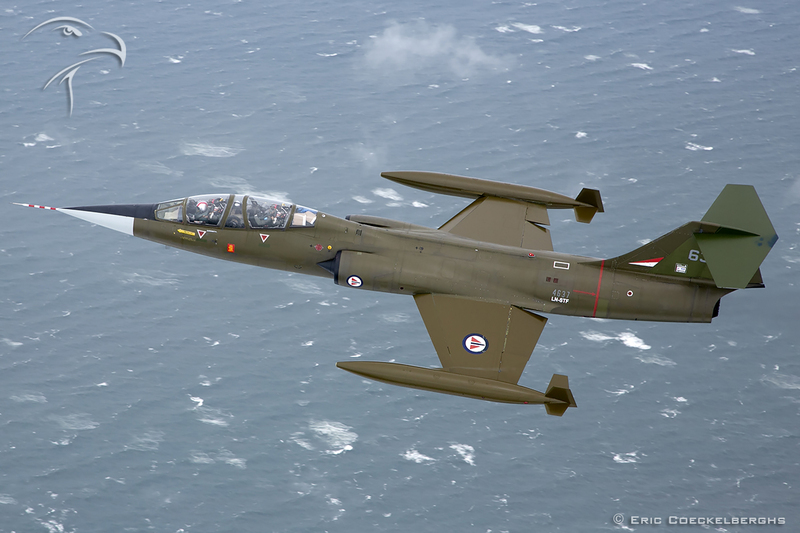 Eventually, the Starfighter got airborne again and joined-up with us again. Of course, they still had some flying ahead of them to Leeuwarden, so we didn’t get as many passes as on Monday, but again, it was worth every minute (and Euro). 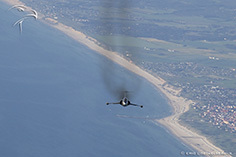 The clouds breaking below us, the coast-line, the smoke-trail, it was just pure Starfighter heaven! 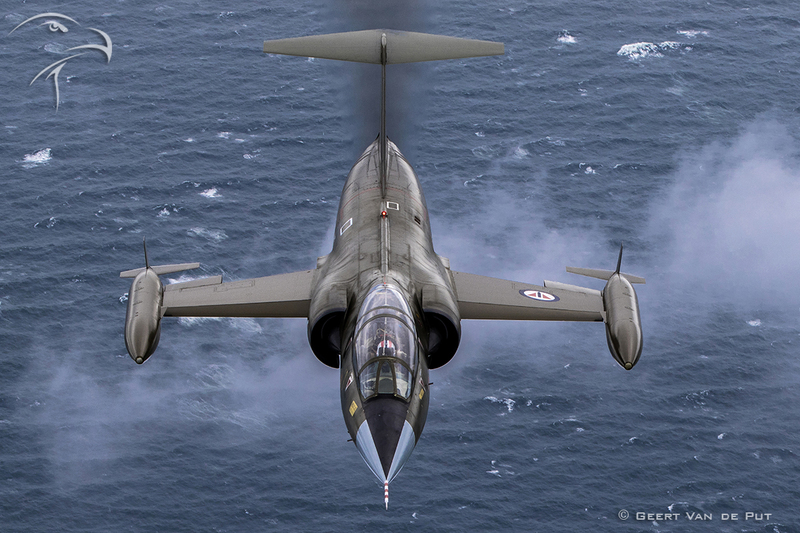 It was a huge privilege to shoot the only airworthy Starfighter in Europe and a dream come true for us. We look forward to repeating this experience next season, when the Starfighter should be participating in airshows where we are present as well. 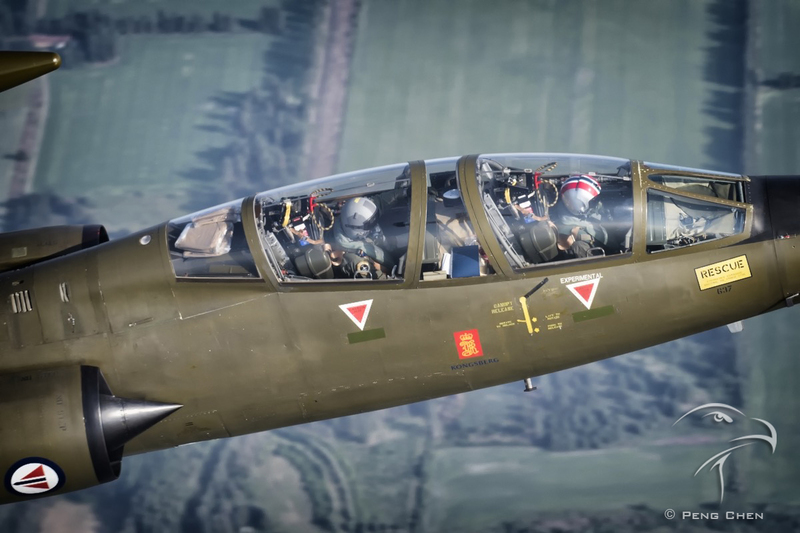 So if you are a huge Starfighter fanatic and you would love to shoot 637 air-to-air, contact us!